The countdown to the reopening of popular club and event centre, Lounge 24, in Awka, Anambra state, may have attracted several reactions, as the forthcoming reopening ceremony is anticipated to shut down the city. 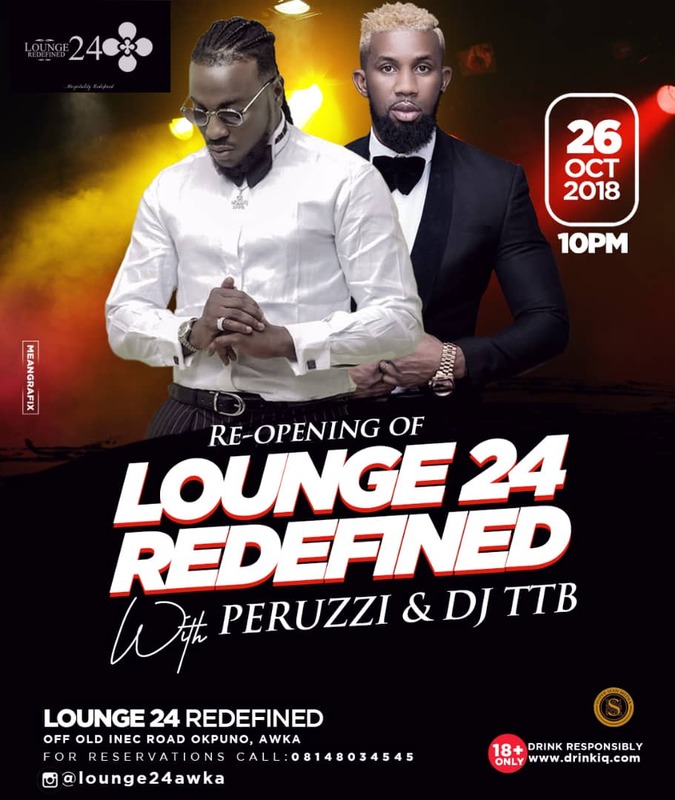 The redefined look, brand, style and organisation of Lounge 24 will be unveiled in a heated event holding on the 26th of October, at Lounge 24 Redefined, in Awka, the capital city of Anambra state. The lauded event will be hosting and guesting popular artists and entertainers from across Nigeria and Africa, with thriller performance and presentations to ensure a very vibrant atmosphere of entertainment. 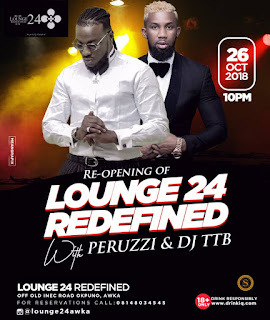 Amongst the celebrities that will perform at the reopening event of Lounge 24 Redefined, are, Perruzi, DJ TTB, Quincy and a host of others. However, the organisers of the event have promised to ensure a smooth presentation of engaging display, by Awka based artists, exciting art presentations, exclusive musical performance, and above all a coordinated event that will be appreciated by guests. Therefore, all roads will lead to Lounge 24 Redefined, located at Awka, off old INEC road, on the 26th of October. The lively event will kick off at 10pm without an outbreak of exciting presentations. According to the organisers, the event will create an enabling atmosphere for the young and old to tangle, socialize and relate in a exciting at ambience of relaxation and fun.